FERRARIO - [ Weapons and artifacts of the Puris Coroados tribes ]. FERRARIO, G. - [ Weapons and artifacts of the Puris Coroados tribes ]. [ Weapons and artifacts of the Puris Coroados tribes ]. - FERRARIO, G.
Title : [ Weapons and artifacts of the Puris Coroados tribes ].. Size : 7.9 x 10.6 inches. / 20.0 x 27.0 cm. 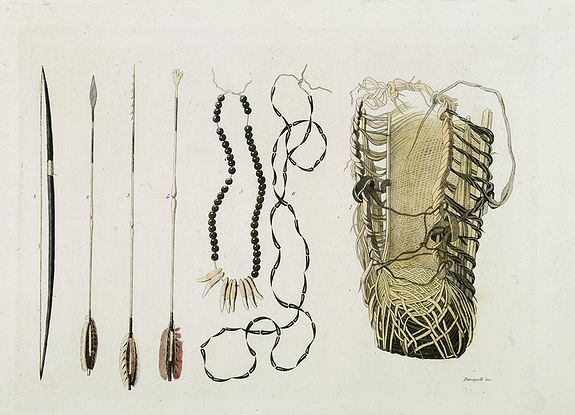 Description :Aquatint depicting an array of weapons and artifacts of the Puris Coroados tribes. The Puri tribe lived along the northern coast of South America and in Brazil. They are extinct, but were last found in the lowlands of the Mato Grosso.